Escape From Venezuela: Do Colombians Forget They Were Once The Refugees? Former Colombian refugee Angelica Lamos directs Venezuelan refugees into the shelter she runs in Cucuta, Colombia. CÚCUTA, COLOMBIA | Angélica Lamos’ house is one of the few places in Cúcuta where you can hear Venezuelan refugee children laughing instead of crying. The kids are squealing, in fact, playing with balloons in the courtyard as jaunty cumbia music wafts in from a corner cafe. They’re not malnourished. They’re not sick. Lamos’ spacious home in Cúcuta’s La Ermita barrio, not far from Colombia’s eastern border with Venezuela, once belonged to her father. Today it’s a shelter she calls Humildad Extrema, or Extreme Humility – and it houses a dozen Venezuelan families escaping the catastrophic economic crisis caused by their authoritarian socialist government. This the last of a three-part WLRN series, "Escape From Venezuela." Read Part One. Read Part Two. For Lamos, the shelter’s name is a reminder that she’s also paying a debt. Fifteen years ago, Lamos and her family owned a 15-acre farm north of Cúcuta. But Colombia’s civil war was raging – and like thousands of other families, hers was threatened by it. Left-wing guerrillas and right-wing paramilitaries repeatedly tried to take the farm. But when the paramilitaries came to recruit her 13-year-old son, Lamos’ family left everything behind and fled to Barinas, Venezuela. Then a few years ago she realized her host nation’s disastrous reversal of fortune. As tens of thousands of desperate Venezuelans began fleeing to Colombia each day, Lamos came back to Cúcuta. Charging often destitute families just $1 a month for rent, she opened her own doors to these new migrants and refugees. 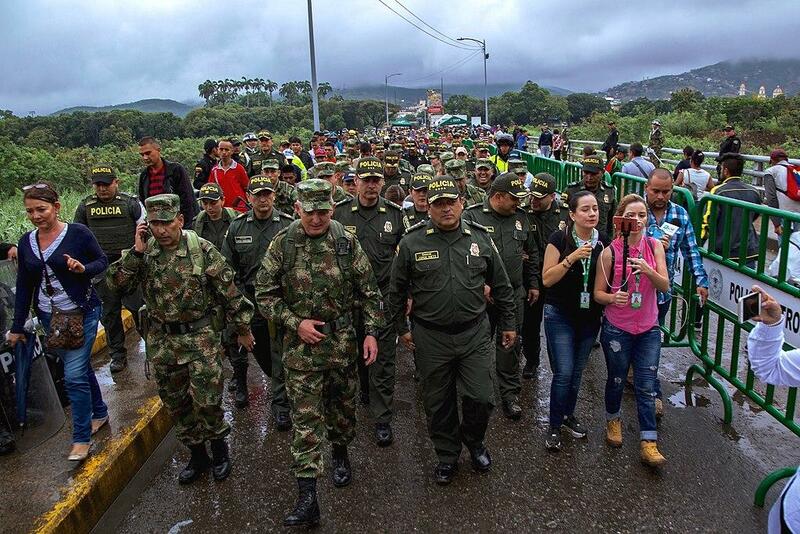 Thousands of Venezuelan migrants and refugees cross into Colombia at dawn recently, led by Colombian police and army. Each day Lamos checks in on her guests, like Lilibel Rangel from Mérida, Venezuela – who says the hotplate she uses in her room may not be the stove she had back home, but it at least cooks the food she can no longer find for her kids in Mérida. For a while, the rest of Colombia was just as generous to the Venezuelans as Lamos has been. But that’s changing. Some 700,000 Venezuelans have settled in Colombia in just the past few years – creating social and economic strains. In Cúcuta, doctors say Venezuelan refugees have increased the emergency-room patient load by 20 percent. As hundreds of Venezuelans waited outside a Cúcuta church this month for U.N. aid, Colombians like single mother Andrea Peña looked on in anger. Not surprisingly, the deportation of Venezuelan migrants is also a more common sight in Cúcuta now. Twenty-year-old Victor Colmenares was among several Venezuelans thrown out this month for illegal street vending. Colmenares was deported because he didn’t have a work permit. Until a few months ago, Colombia had issued documents like those quite liberally to Venezuelans. But now, for example, new border entry cards for Venezuelans have been suspended. Colombia’s growing anti-immigrant sentiment is also why the U.N. Refugee Agency, or UNHCR, recently launched an anti-xenophobia campaign. “We’re seeing more discrimination,” Jozef Merkx, who heads the agency’s Colombian operations, told WRLN in the Colombian capital, Bogotá. 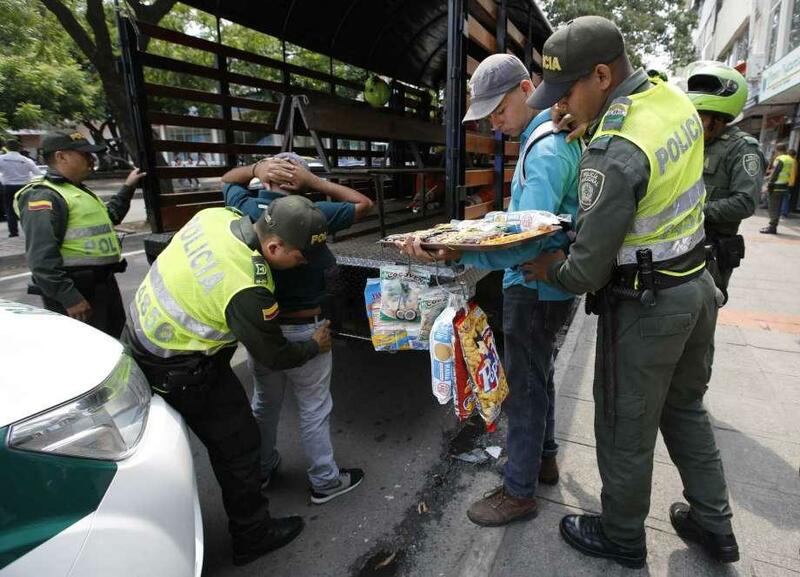 Colombian police deport Venezuelan migrants detained for illegal street vending this year in Cucuta. That’s a hard fact for Colombians to ignore. For generations, their country was tormented by civil war – which just ended a couple years ago – narco-violence and deplorable inequality. As a result, they migrated in droves to Venezuela. Colombia's own refugee past is still remembered at least in South Florida, home to the U.S.’s largest Venezuelan and Colombian communities. “Venezuelans are getting the same reality the Colombians got when they came to Venezuela,” says Colombian expat Fabio Andrade, who heads the nonprofit Americas Community Center in Weston. Much of the nonprofit’s work is business networking, and Andrade spends a lot of his time helping newly arrived Venezuelans in South Florida. He knows that back in his homeland, “Colombians are looking down on Venezuelans” these days – but he doesn’t want that to happen in the U.S. Nor do Venezuelan expats like Miami paralegal Rafael Moros, who once lived in Capacho, just across the border from Cúcuta. Alvaro Gelves became one this month. I met Gelves as he entered Colombia at Cúcuta – crossing the Simón Bolívar International Bridge, which now sees a flow of about 20,000 Venezuelans a day. Gelves is an industrial logistics expert from Valencia, Venezuela, where his Colombian parents migrated 40 years ago. Today he and his wife have an 8-month-old baby they’re struggling to feed. So he’s taking his parents’ journey – in reverse. Emergency room patients, many of them Venezuelan migrants who can't obtain medicines or treatment back in their country, at the Erasmo Meoz Hospital in Cucuta, Colombia this month. Nearby, Venezuelan teacher Elsa Sanguino pondered that epic collapse of her country, which has the world’s largest oil reserves and was once one of Latin America’s richest countries. “It’s very humiliating for Venezuelan people to come here in these conditions, you know,” Sanguino said. It's especially embarrassing for professionals. Three months ago, Rebeca Prieto was an oil engineer in Maracaibo, Venezuela. Now she’s a nanny in Cúcuta, accepting a salary that's one-third of Colombia’s minimum wage. Her employers get away with paying her so little because she needs the money. In Bogotá, Jonathan Caldas feels the same way. After he left Venezuela not long ago, he opened a barbershop called The Kingsman – an inverse echo of his parents’ story. In 1976 they fled Colombia and ended up opening barber shops and beauty salons in Puerto Ordaz, Venezuela. “My mother, she told me that she was crying for two years because she felt the Venezuelan people, they don’t like the Colombians then,” Caldas says. 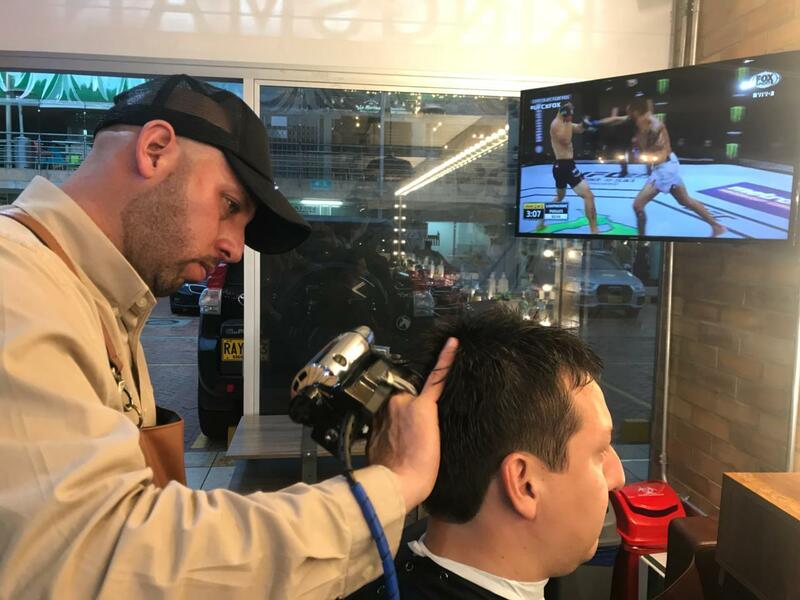 Venezuelan barber Jonathan Caldas cuts a customer's hair at his shop, The Kingsman, in Bogota, Colombia, this month. Eventually they did feel welcome, and their shops became important places for jobs and community for other Colombian refugees. That is what The Kingsman has become for Caldas and fellow Venezuelan refugees in Bogotá (not to mention a place where young men come to get buzz cuts to look like reggaeton stars). It's a reminder, perhaps, of the larger history Venezuela and Colombia share. In the early 1800s they were briefly part of the same country, a republic known as Gran Colombia. In those days it was the triumph of liberation from Spain that brought them together. Today it’s the tragedy of escape from Venezuela that’s joining their border again. Manuel Rueda contributed to this report. First of a three-part WLRN series, "Escape From Venezuela"
CÚCUTA, COLOMBIA | This is what the Venezuelan refugee crisis sounds like: the fists, knuckles and open palms of destitute – and above all hungry – Venezuelan migrants pounding on the metal gates of humanitarian relief stations here in the Colombian border city of Cúcuta. CÚCUTA, COLOMBIA | It’s not easy for Jesús Mendoza to talk about all the things he’s had to sell to buy medicine – life-saving medicine. CÚCUTA, COLOMBIA | Así suena la crisis de refugiados huyendo de Venezuela: los puños, nudillos y las manos abiertas de venezolanos indigentes -y sobretodo hambrientos- tocando las puertas de metal de las estaciones de ayuda humanitaria establecidas en la ciudad de Cúcuta, en el lado colombiano de la frontera. CÚCUTA, COLOMBIA | No es fácil para Jesús Mendoza hablar de todas las cosas que ha tenido que vender para comprar medicinas - medicinas que lo mantienen con vida. Jesús recibió un transplante de riñón y tiene que tomar medicinas para no rechazar el órgano, sin importar cuánto cuestan. Y como Jesús vive en Venezuela, el precio es frecuentemente astronómico. Escape de Venezuela: ¿Han olvidado los colombianos que ellos también fueron refugiados alguna vez? CÚCUTA, COLOMBIA | La casa de Angélica Lamos es uno de los pocos lugares en Cúcuta donde se puede oir a los niños refugiados venezolanos reír en vez de llorar. De hecho, los niños chillan de placer jugando con globos en el patio de la casa mientras el ritmo alegre de una cumbia se cuela desde el café de la esquina. No están desnutridos. No están enfermos.